a lil peek from my make-up pouch… | her powder room! 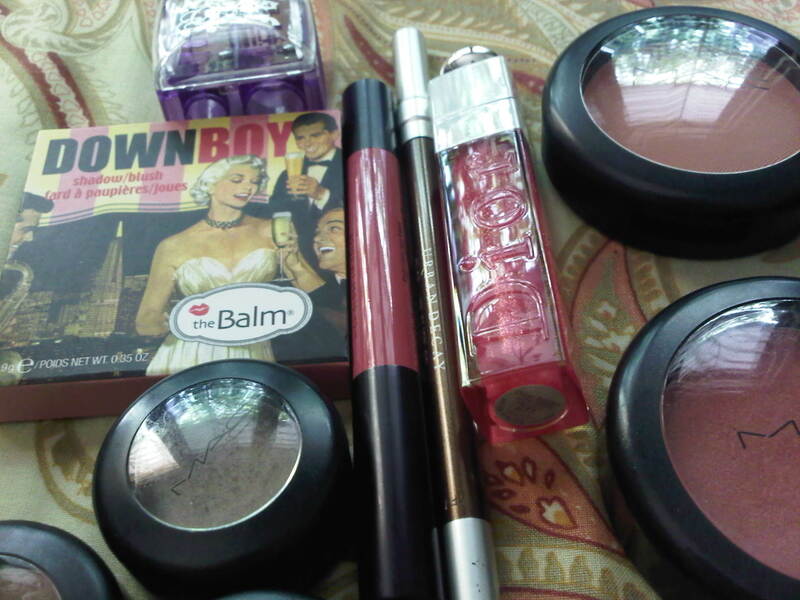 – The Balm Blush in DownBoy: it’s a pretty pink. it’s a perfect natural pink for my skin tone. – MAC Peachykeen:Sheertone blush from mac. Has a peachy-pink tone. Less peach and more pink in my skin tone. – MAC Melba:It has matte finish. Peachy-brown matte blush. – UD 24/7 eye glide in bourboun: it’s fabulous! i love it 🙂 finally i found my HG :)the color is dark chocolate with gold and silver glitters. – MAC Single eyeshadow: Satin Taupe, Brule and Patina. This entry was posted in Beauty, Borjouis, Daily Babbling, Dior, MAC, The Balm, Urban Decay and tagged blush, bourboun, brule, dior addict super gloss, downboy, eyeshadow, grinder, lovechild, MAC, mac cosmetics, make up, makeup, patina, satin taupe, super saturated high gloss, the balm, UD, urban decay. Bookmark the permalink.